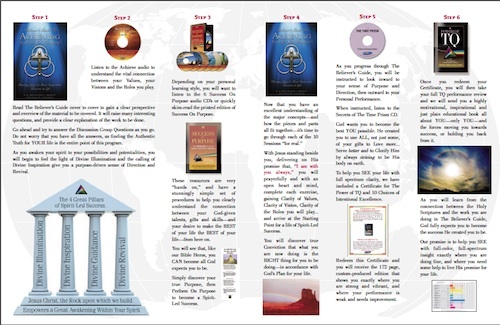 Receive The Believer’s Guide to Achieving Success On Purpose FREE—or the full 3 book, 8 CD Believer’s System described below for just $1 + S&H. This highly motivational, inspirational and spirit-driven new program will help you unleash your full potential—to glorify God by becoming the Spirit-Led Success He created you to be. You will also receive a FREE copy of Dr. John Edmund Haggai’s inspiring new book, Success Secrets of the Bible, when you order the Believer’s System offered below for just $1 + S&H. In this powerful 213 page book you will learn how to connect timeless biblical principles to take the next step towards your God-Ordained Destiny. There is a tremendous amount of information on this page for your consideration… put there to help even the skeptic clearly understand our commitment to Christ. Since we offer a 100% money back guarantee, read as much as you like, click to order with confidence, and actually use your precious time engaging in this fabulous program rather than just reading about it! Because we are the world’s leading publisher of virtual training products for personal and professional excellence, we understand the difference between exceptional performance… and everything else. Over the past 25 years, we have helped millions of people achieve a heightened level of success in all they do — personally and professionally. We developed The Believer’s Guide to Achieving Success On Purpose to equip “ordinary” Christians with the tools required to become EXTRAORDINARY Champions for Christ in every sense of the term: Discipleship, Stewardship, Leadership and the ability to GROW His church. Our Mission is to field Champions of Spirit-Led Success in every church on Earth… 100 million men and women who will go on to help everyone they touch become everything God created them to be. True disciples in every sense of the word. This page, indeed the entire site, is designed to help you transform all your God-given gifts and talents into the skills necessary to do Christ’s work here on Earth — acting as His heart… hands… feet… arms… legs.. eyes and ears — to make the world better for all God’s children. To help you actually LIVE The Purpose-Driven Life Pastor Rick Warren wrote about, we will give you a copy of The Believer’s Guide free… or the entire Believer’s System + Success Secrets of The Bible bundle on a trial basis for just $1 + S&H. 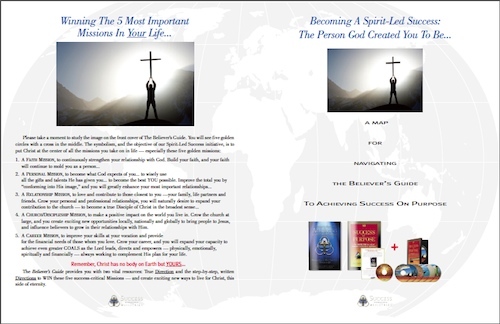 To introduce you to the ideas behind Spirit-Led Success, we will send you the 144 page printed edition of The Believer’s Guide Free of charge or obligation. All we ask is that you pay our standard Shipping, Handling & Processing charge to get it to you. See for yourself how this program works… and how you can unleash the Spirit Within. Limit one per customer please. This offer does NOT include Success Secrets of The Bible. If you prefer, we will send you the entire Believer’s System described below for just $1.00 + S&H on a trial basis for the next 30 days. 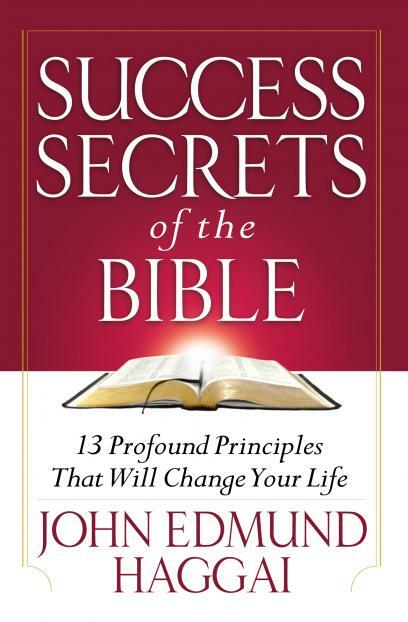 As a GIFT to you, we are also including a FREE copy of Dr. John Edmund Haggai’s life-changing new book, Success Secrets of The Bible while supplies last. Read the books… listen to the 8 CD’s… and do the life-changing exercises. If the Believer’s System doesn’t change the very fabric of your future, return it and owe nothing further. Limit one per customer please. See complete details below. Do you ever get the feeling that you’re not quite living life to the fullest… actually using your God-given gifts and talents to become everything He wants you to be… fully ALIVE in the truest sense of the word? We know that Christ is ALIVE in us. He wants us to be His hands… His eyes… and His beating heart. To do His work on Earth. To fulfill His plan for our lives. It’s time we rise to the challenge and glorify Him by becoming everything He created us to be. Pastor Rick Warren, in The Purpose-Driven Life, asked a vital question, “WHY On Earth Am I Here?” He concluded that we are here for a Mission, and God wants us to successfully achieve the Mission. The answer is simple. You are going to PERFORM on Purpose to become a Success On Purpose. By putting Christ at the center of your 5 most important missions in life, you will awaken the Spirit within to create an unstoppable sense of passion and purpose. With Jesus by your side as you do the work in The Believer’s Guide, and by aligning your life with His promise of Divine ILLUMINATION — that He is the Light of the world… Divine INSPIRATION — that through Him, all things are possible… Divine GUIDANCE — that He is the way… and Divine REVIVAL — that He is the Truth and with you always… you will become all that you are meant to be… a Champion of Spirit-Led Success. You can preach about becoming Christ’s hands on earth, or you can actually BECOME His living body… pledging to be all He expects you to be. You can rise to the challenge and extend your personal power to achieve the RESULTS He expects of you, or you can play small. You can become a Champion for Christ, or not. Champions are the drivers of your ministry’s SUCCESS… the 20% of your congregation who get 80% of the mission-critical work done each day. They give more… serve more… and glorify God by rising to every challenge. 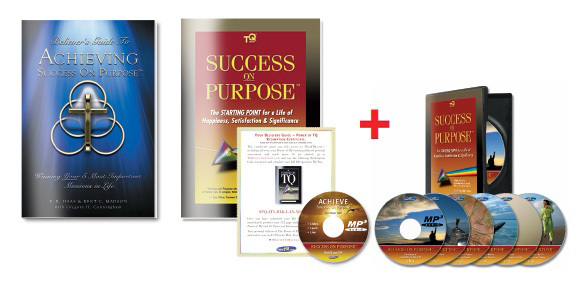 our best-selling, 8 CD Success On Purpose package. SAVE $100 Now! Order a personal copy today for Only $49.95: $1 + S&H now, the deferred balance in 30 days. IMPORTANT: The SRP on site is $149.95 with multiple copy or group discounts available. The $49.95 promotional price is not offered elsewhere — is strictly limited to ONE copy only — and is subject to change without notice. This is our way of seeding Champions within 400,000 Churches worldwide this year to engage in greater DISCIPLESHIP, LEADERSHIP and CHRISTIAN GROWTH. When you order, your Credit Card will be charged for $1 plus shipping, processing and handling. In 30 days, we will then automatically bill your card for the balance of just $48.95. In the unlikely event it is not for you, simply return it within 30 days and we will delete you from our records and you will not owe us a single dime more. If you wish to return it, simply send us an email letting us know it is on its way back to us. Otherwise, make it your next Life Group program at church! so your purchase is risk free. 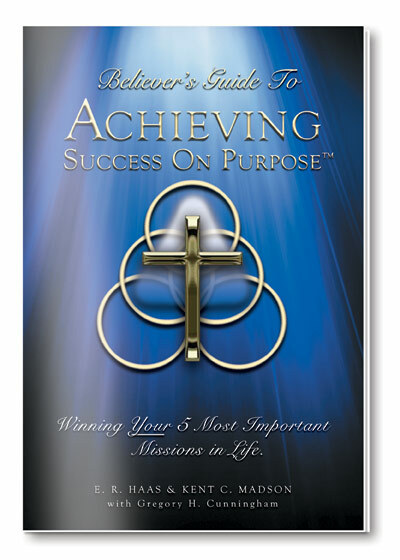 As you can see from the cover, the Believer’s Guide puts Christ at the center of your 5 most important missions in life. God wants you to win your FAITH Mission — to give you and everyone around you greater belief in your ability to live the dreams and visions He has given you. It is impossible to become the full success God expects you to be without continuously growing your FAITH. God wants you to win your PERSONAL GROWTH Mission — to help you become the person He meant you to be… to become the success for which you were created. He expects you to continuously GROW as a person — to become the BEST you possible. God wants you to win your RELATIONSHIP Mission — to be the great provider… the great protector… the great friend… the great employee or boss… the great partner you and your spouse are destined to become. He expects you to live with others in harmony and joy, and promises to help you and your partners do exactly that. God wants you to win your CHURCH/COMMUNITY Mission — to fulfill the Great Commission by becoming a Disciple Maker… men and women who will go on to create Disciples who will then help others become the Spirit-Led Success they were created to be. He expects you to disciple others and assist them in all ways possible to grow their faith. God wants you to win your CAREER/MONEY Mission — to live out of abundance and prosperity… not out of desperation and want. He expects you to become a successful leader by fully utilizing ALL your gifts and talents… in His service and to His glory. No question, God wants you at your best… to become a WINNER in every sense of the word… to become everything He expects you to be… truly ALIVE. Is This What God Really Wants? There is a simple, but profound answer to this question. He wants YOU, fully ALIVE. According to Thomas G. Long from the Candler School of Theology, there is a short and direct answer to this age-old question. The pastor who preached the sermon we call the Letter to the Hebrews felt the same tremor of terror in his own congregation. Worship had become for them “a blazing fire and darkness and gloom” (Heb. 12:18). People were staying away from services. They had drooping hands and weak knees from the heavy burdens of their religion. The problem? No, God wants only one thing, said the preacher of Hebrews. Not an unblemished goat or a fat pledge card, not a gift to the building fund or a promise to walk across burning coals. 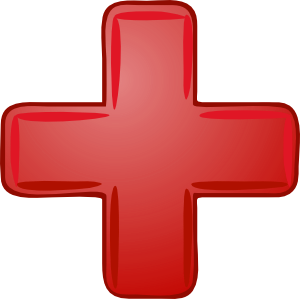 God desires this: A fully human life, a life well lived. “The glory of God,” said Irenaeus, “is humanity full alive.” But, of course, a life truly well lived is the one thing we cannot, on our own, bring to God. So it was our brother Jesus who walked the same paths as we, experienced the same temptations as we, endured the same afflictions common to our humanity, but who never lost his bearings, never compromised his humanity. It was he who walked, as the high priest, into the great sanctuary and, on behalf of us all, placed himself into the offering plate, the one thing God truly desires: a human being fully alive. It was not pain and violence that God desired. It was human life as God created it to be, summoned it to be. This is the entire point behind our Champions of Spirit-Led Success initiative… a simple step-by-step process to help people become the success God created them to be. No question, God wants you to be fully ALIVE… to become the BEST you possible. He wants you to become a Champion of Spirit-Led Success — a true winner in every sense of the word. He wants you to Disciple others to help them become fully ALIVE — in the spirit and in the flesh — to also become Champions of Spirit-Led Success themselves. He wants every member of every church on Earth to become fully ALIVE — to live His plan for our lives — not just making a puny little difference in the world… but with His POWER added to ours, to make the world DIFFERENT — a better place for all of us to call home for now. No question, He wants you to become a SUCCESS and do it ON PURPOSE. YOU, continuously becoming the best YOU possible… a person who uses all their talents in His service — to Love More… Serve Better… and Glorify Him by respecting His expectations for you. To become everything He created you to be: Fully Alive… spiritually, emotionally, personally and financially — living in grace and abundance. Your satisfaction is unconditionally guaranteed. You want to know God better, to have a powerful, personal relationship with Him as you discover the spiritual connection between living your faith and achieving your dreams and visions. You want to grow as a Christian, to become all God intends you to be. You want to expand your church, broadening the body of Christ at large. You want to lead, teach, train and disciple others to become the success God created them to be. missions in life — to become a Champion of Spirit-Led Success — growing personally, professionally, spiritually and in your relationships. God wants this for you too… to become His Champion of Spirit-Led Success… to employ all your gifts and talents to their highest and best use… to Love more… Serve better… and glorify Him by putting His Word into action. If you are experiencing a bit of “Holy Unrest” or “Divine Discontent,” please review this offering with a discerning heart. He wants you to Awaken the Spirit Within to become all that you are meant to be. And so do we! “People are in search for what is authentic and what is integral. They want something to believe in that will not fail them over time. The principled individual must be rooted and grounded in principles that will assist in influencing his world view so that it can remain biblical. Then, he wishes to be able to speak the language of the people in order to penetrate their world with the truth. The Believer’s Guide To Achieving Success On Purpose is a highly personalized tool for dynamic growth in Christ. Capturing each person’s desires, the Believer’s Guide leads you through a step-by-step, exciting journey into the world of purpose-filled living in all areas of your life! It is our most fundamental belief that God wants you actually LIVE the desires of your heart, and He wants you to discover the things that are most important to you and Him. He wants you to have an abundant life and become, in every sense of the term, a Spirit-Led Success with a powerful capacity to Love greater… Serve better… and Glorify Him in every choice you make and every action you take. Our most basic calling then, is to create 400,000 Champions of Sprit-Led Success this year — one in every church in America — who will go on to disciple others to become the success God created them to be. The “Believer’s System” guides you through a process using Scripture, God’s Divine Guidance and the innovative TQ (Time Quotient) tools as a way for you to discover what’s holding you back from living your best life now. As a Champion of Spirit-Led Success, you will begin to achieve extraordinary experiences and accomplishments — the life God has always intended for his children. Absolute Clarity of the Roles you play. And the unflinching COURAGE to take bold ACTION to use your God-given talents, gifts, and skills to their maximum potential. And, please, pause long enough to take in this phrase, “to take bold ACTION to use your God-given talents, gifts, and skills to their maximum potential”. That’s our prayer for you. That’s the driving force behind the Believer’s Guide. With the Lord standing by your side, we will do exactly as the title promises: Help you find Spirit-Led Success — the heightened capacity to Love… Serve and Glorify God in your daily actions — by giving you the tools to actually WIN Your 5 Most Important Missions in Life. Discover exactly what has been missing in your life… and, with Christ by your side, eliminate it. You have been created for success — spiritually, physically, emotionally and financially. With The Lord’s help, you will see precisely what you must do to achieve a life of passion and purpose. Become Christ’s eyes, ears, hands, feet… indeed, His body here on Earth… doing His work in your life and others… to the glory of our Heavenly Father. This is a program that takes most people less than 30 hours to master. Follow the map, do the work, and you will discover HOW to become the success God created you to be. In other words, how does Jesus’ active involvement in the process of Spirit-Led Success result in the material changes we hope and pray for? Because we are performance experts, we train people based on cause and effect principles that consistently produce the results expected. In faith matters though, it is sometimes difficult to see and understand how things work, and how to approach a problem leading to a step by step solution. After a great deal of research and prayerful discussion, we identified a simple, yet theologically correct way to depict and explain the process of Spirit-Led Success so people could instantly see the relationship between the work that needs to be done, and the Christian context for actually doing the work. Thus, the concept of becoming a Spirit-Led Success is structured upon 4 Great Pillars, all built upon the rock of Jesus Christ. As you can see, Spirit-Led Success is based on the pillars of Divine Illumination — where we ask Jesus to shed His light on the pathways in our life — the positive, the negative, and everything in between — for the purpose of gaining clarity in all that we could and should become… Divine Inspiration — where we ask Jesus to spur our innate creativity… Divine Guidance — where we ask Jesus to guide us to do the Right Things, in the Right Way, for the Right Reasons, all at the Right Time (your 4 R’s of success)… and finally Divine Revival — where we ask Him to renew us, revive us and “Awaken the Spirit Within” our very being. Clearly, unleashing your full potential is predicated on building your success upon these 4 pillars, and with Jesus leading you through the process, your life becomes a living testament to His plan for your life. Your MISSION then, is to become the best you possible — to use all your God-given gifts and talents to their fullest extent possible — to achieve a life of true and lasting success. What we describe in The Believer’s Guide as becoming a Success On Purpose by Performing On Purpose. Who Benefits MOST from The Believer’s Guide? Since the release of our first edition, we have heard from thousands of our customers — many of which are Ministers who face the “real” of life daily. Here is a short list of what these men and women, called and Ordained by God Himself, tell us they see from their pulpits… and why they whole-heartedly endorse Success On Purpose. The woman who has shattered the glass ceiling and is now looking for a bigger challenge… and a lot more meaning in her life. People battling clinical depression… battling cancer… battling all forms of medical issues who need to look beyond their illnesses… and find a REASON for hope… a REASON to put their whole heart into the battle. People who have given up all HOPE for living their dreams… people who have lost the COURAGE to see themselves WINNING… people who have started to believe that the worst of life is inevitable… and there is nothing they can do to turn their lives around. The common thread is people who are looking to renew, restore, reinvigorate and recreate their lives… and are looking for the Starting Point for making the REST of their lives, the BEST of their lives. It has been said that the two great tragedies in life are these: Not knowing your purpose—not knowing why you are here on Earth… and once you know your purpose—not LIVING it with passion and dedication… every single day you are alive. Just HOW can I live a life of passion and purpose? What, exactly, am I expected to do? How can I transform my life’s purpose into an unstoppable mission… and ultimately achieve the success I desire, personally and professionally? You may have struggled with clarity of purpose and direction for your entire life. By the time you complete Success On Purpose, this will no longer be an issue. You will—maybe for the first time ever—discover your Natural Mission in life. 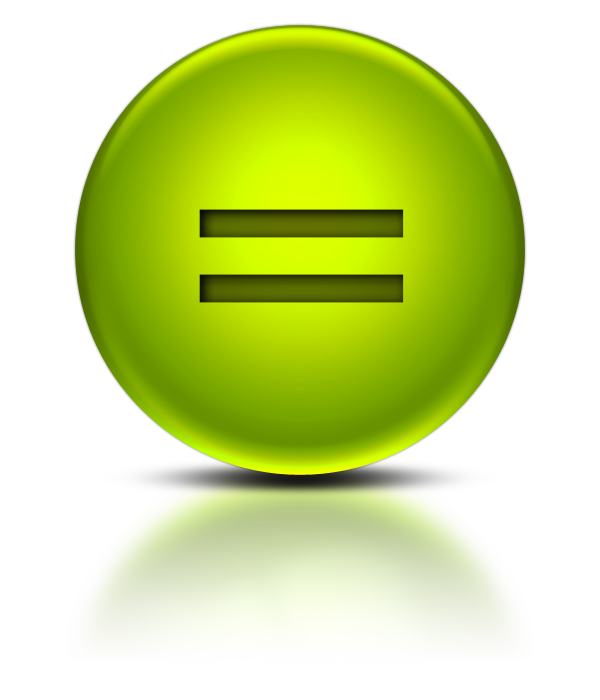 Natural Mission—a formula that contains only 3 variables. living your dreams and goals… the foundation for achieving Purpose-Driven Success. Success On Purpose will give you the tools to realize your full potential… to consistently live your best life ever. You will discover how your values, vision, and roles combine in your life… giving you inherent direction and purpose for every choice you make and every action you take… permitting you to create the life you were intended to live. Natural Mission forms… and find Inherent Direction for your life. Purpose… achieving the Purpose-Driven Success you so richly deserve. This will lead you to living your BEST life, now, and at every point in time. 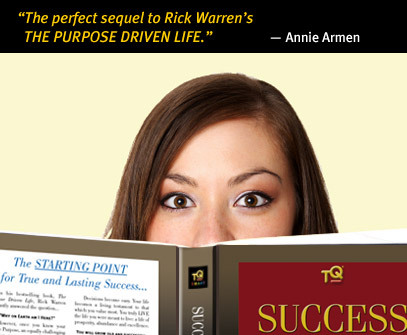 You will learn how to become a Purpose-Driven Success. You will discover—and achieve—your life’s Natural Mission. Why? Because your purpose is what establishes your direction in life. In a sense, your purpose is your life. Understand the WHY of your existence, then living your purpose becomes much easier—and far more rewarding. Without a clear sense of “Who Am I, and Why Am I Here,” there is no need to improve your performance. You don’t know where you are going, so there is no real need to help you get there any faster. just passively watch your life go by. Why is this a serious issue? Have no way to focus their performance on what matters most to them. Worse, they start believing the “Myth of Life”… that they are not “good enough”… not “smart enough”… not “rich enough”… or are too young… too old… the wrong education… not enough money… not SOMETHING enough. Pure bull. This is a Life and Death Issue. Understanding the root-cause of this lack of direction and purpose is important because the vast majority of people we test at ThinkTQ.com admit to having little or no direction in their lives… no strong sense of purpose… no strong sense of mission… no real passion for which they are trading the ONLY life they have to live. inside each day—committing slow-motion suicide. This is a tragedy, since it is so easily corrected. Thus, we wrote Success On Purpose to help people INSTANTLY improve their sense of purpose, passion and mission. Today—not 20 years down the line. You do not need to burn up one more precious moment of the only life you have to live. You’ve been doing it the HARD way. There is an EASY way to the life you desire… one that takes the same amount of work you are already doing — maybe even LESS — but will produce the meaning you are sorely missing. It takes no more TIME to be rich than broke… it takes no more EFFORT to perform on purpose than go through the half-hearted motions and get little in return. We do not promise you a get rich quick hustle… or that you will be secretly transformed just by thinking positive thoughts. What we do GUARANTEE is you will find that which is MOST important to you… and will find an amazing new Starting Point for lasting success. Yes, take this program seriously, and your life will change at the most fundamental level: from your SOUL, inside out. Since the initial release of Success On Purpose, Version 1.0 beta, we have had a tremendous out-pouring of comments, suggestions, testimonials and fabulous success stories… from people in every walk of life: Ministers, salespeople, executives, single moms, people who have lost hope, people looking to rekindle their dreams, people who are at the top of their respective professions and want to pass their successes on… indeed, people who want to live a life of passion and purpose.